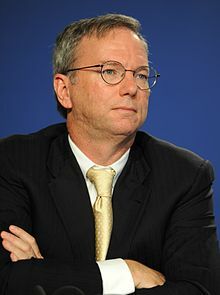 Eric Emerson Schmidt (born April 27, 1955) is an American businessman and software engineer. He is known for being the Executive Chairman of Google from 2001 to 2015 and Alphabet Inc. from 2015 to 2017. In 2017, Forbes listed Schmidt as the 119th-richest person in the world, having US$11.1 billion. ↑ "Forbes Profile Eric Scmidt". Forbes. May 16, 2017. Retrieved May 16, 2017. ↑ "Eric Schmidt to become technical advisor to Alphabet". ↑ 3.0 3.1 "Eric Schmidt is stepping down as the executive chairman of Alphabet". 2017-12-21. ↑ "Google Biography for Dr. Eric Schmidt". Retrieved 18 July 2016. ↑ "Google's Eric Schmidt Talks About How to Run the World (Not That He Wants To)". Los Angeles Times. 9 June 2008. Retrieved 18 July 2016. ↑ "Forbes List of Billionaires". Forbes. Retrieved May 16, 2017. This page was last changed on 25 September 2018, at 03:36.